From the dawn of history, human civilizations have prospered through partnership with the simple single-cell fungus we call yeast. It transforms sugars into alcohol, puffs up bread dough with bubbles of carbon dioxide, and is used to produce an assortment of fermented foods. It has become the workhorse of modern biotechnology as the source of life-saving medicines and industrial chemicals. And, most recently, the manufacture of ethanol as a biofuel from corn and sugarcane has launched yeast onto the frontline of our efforts to slow climate change by reducing carbon dioxide emissions. Our bond with yeast probably began tens of thousands of years ago, with the unconscious use of the fungus to brew palm wine. This practice spread as Homo sapiens migrated from the Rift Valley and our unusual symbiosis with Saccharomyces cerevisiae (the sugar fungus) deepened and diversified. The development of brewing with cereal grains and winemaking from grapes is thought to have fostered agricultural settlement. According to this idea, civilization began in villages surrounded by golden fields of barely and rows of grapevines on the hills. The use of yeast for making bread followed when yeast escaped from a beer vat. We were tamed by yeast and it has served as the most important microbe in human culture and commerce. One way to measure the importance of yeast is to evaluate its vast economic impact. In the United States, for example, the Gross Domestic Product of the world’s largest economy topped $19 trillion in 2017. According to the sources detailed below, 5% of this figure—more than $900 billion—is directly reliant on the biochemical activities of yeast. Brewing, winemaking, and baking dominate this mycological enterprise, but the diverse roles of yeast in the pharmaceutical industry, biofuel production, and other market sectors complete the picture. The industrial applications of this single species of fungus support more than five million American workers, or 3% of the US workforce. This is more than twice the number of people employed in car manufacturing and sales. A similar analysis could be performed on any national economy. In the United Kingdom, for example, the alcohol market represents 2.5% of GDP and employs 770,000 workers in brewing, distilling, and associated retail jobs. In the European Union, household spending on alcoholic beverages exceeded €130 billion in 2016. Yeast is important in every country where the majority of citizens do not adhere to a faith, like Islam, that prohibits alcohol consumption. There is a yin and a yang to alcoholic fermentation with the mood-elevating effect of beer and wine offset by the damage caused by overindulgence. The value of yeast is even higher than the numbers suggest, because insulin produced by genetically modified yeast allows millions of patients with diabetes to pursue productive lives. Other bioengineered strains of the fungus produce the vaccine against the human papillomavirus (HPV) and an injectable medicine to treat eye degeneration. Capsules of yeast are sold as a probiotic treatment for all manner of health issues and seem to be effective as a therapy for traveller’s diarrhea. Yeast is the champion microorganism in biomedical research and is playing a crucial role in genetic investigations on cell development, aging, and cancer. Three Nobel Prizes for Physiology and Medicine have been awarded to yeast researchers in the last decade. For most of our shared history we had no idea what made sweet liquids ferment and the blessings of many gods were imagined in these seemingly miraculous transformations. The gods have disappeared, as they tend to do, but we should continue to worship the brilliance of yeast. Now that we know more about the workings of yeast cells than almost anything else in the nature, we should revere the sugar fungus as much as the warmth of the sun. Feature image credit: Bottling Prince Tuesday 2014 by Allagash Brewing. CC BY 2.0 via Flickr. Nicholas P. Money is Professor of Botany and Western Program Director at Miami University in Oxford, Ohio. He is an expert on fungal growth and reproduction. 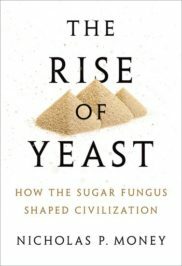 His books include Fungi: A Very Short Introduction, Mushroom, and most recently The Rise of Yeast: How the sugar fungus shaped civilization. The author would like to thank Dr. Giuliana Furci, Executive Director of Fundación Fungi for encouraging this economic analysis.